The author has done a commendable job in tracing the history of fortifications in Kent. The question with a book such as this is “where to start?”, closely followed by “how much detail?” At first glance, this is a comprehensive study. After reading through the book, a number of omissions can be observed and the level of detail varies, which is entirely understandable when such a wide historical period is covered. Each reader may see further omissions, depending on the level of their knowledge of the subject. Early history also produces perceptions of omissions because much of this period is currently going through one of the periodic re-evaluations as new archaeological discovery questions earlier assumptions and beliefs. DESCRIPTION: The author has done a commendable job in tracing the history of fortifications in Kent. The question with a book such as this is “where to start?”, closely followed by “how much detail?” At first glance, this is a comprehensive study. After reading through the book, a number of omissions can be observed and the level of detail varies, which is entirely understandable when such a wide historical period is covered. Each reader may see further omissions, depending on the level of their knowledge of the subject. Early history also produces perceptions of omissions because much of this period is currently going through one of the periodic re-evaluations as new archaeological discovery questions earlier assumptions and beliefs. From reading the nicely judged text, it is clear that the apparent claim in the title does not accurately match the author’s views in all respects. 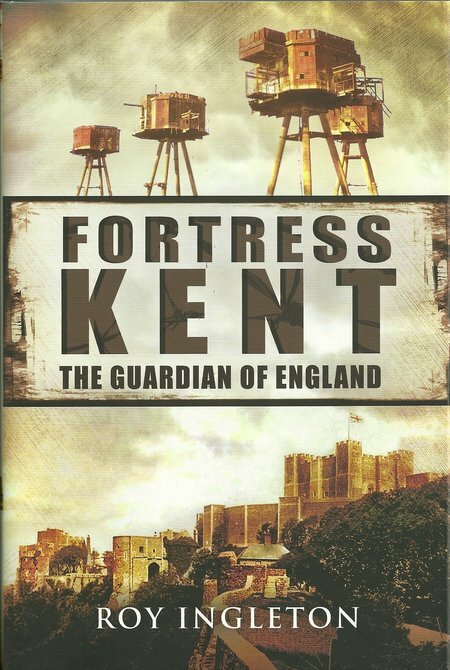 Fortress Kent includes fortifications that were not necessarily intended to defeat a foreign threat, but then Kent is a relatively modern description of an area when cast against the full period that the author has covered. Originally, the British Isles was not separated from Continental Europe. The major area was connected by a broad land bridge and there was a regular ebb and flow of people who ranged across the land as hunter-gatherers. That did not mean that they were itinerants. They established settlements and fortifications but they built in wood and the evidence of their temporary settlements is found largely by accident. Logic says that Kent contained some of those settlements that are now lost to us. As the land bridge became inundated, those already in what became an island began to construct more significant fortifications and settlements but the current knowledge probably covers only a small percentage of what once existed. From the surviving remains we know that hill forts were constructed with earthworks and timber palisades, surrounding accommodation that was based on timber construction, leaving today only the earthworks and post holes. The earthworks are less impressive than they were originally, as ditches have filled and banks and mounds have slowly compacted down. Often, these fortifications are only visible to radar or aerial photography. During this early period some existing caves were occupied and expanded, some over many centuries, before falling into disuse, only to be rediscovered and used as a fortified position. The period of Roman occupation is on firmer ground with a number of Roman forts surviving or being rebuilt by later generations. Rochester, Richborough, Reculver and Dover all contain fortifications first built by the Romans. However, the historical perceptions are changing. It is now becoming accepted that the British Isles has seen frequent waves of immigrants and invaders, mostly in small numbers and where the incomers merged into the general population. This explains why the Romans spent so much effort from the earliest days of their invasion to build coastal defences. By the end of the Roman period, the flow of new waves of immigrants and raiders did not change significantly and the original established wisdom that the Roman Legions ruled for four centuries to be followed by a huge invasion from the German plain, to be followed by huge waves of Scandinavian invaders is probably inaccurate. The establishing opinion is that the Romans depended on local allies and their period in Britain probably made little difference to the regular, but relatively small, waves of immigrants. That suggests that fortifications were established to protect against internal revolts, and to deter frequent small-scale raids by pirates. The Normans arrived and initially used prefabricated wooden castles that were then progressively replaced by substantial stone fortifications. Kent enjoys a number of these castles. When the Normans built castles, they were as much an evidence of power and centres of administration, as they were to guard against invaders. During the Medieval period, castle building became a popular pastime and was often as much an evidence of personal advancement as of military necessity. Some of these fortifications were built on early Roman and Norman defences. Within Kent, as across Britain, many medieval castles were still built largely of earthworks and wood, surviving only for short periods, often being demolished by the King because the owner offended in some way. The author has concentrated effort on the more substantial fortifications that survive to the present time. Kent has many examples of city walls, gateways and castles that survive largely intact or fully intact. He has described their evolution and place in historical development. The Tudor and Stuart period is not generally known for its fortifications, but it saw a steady building program and the integration of guns into designs. Some of the most beautiful examples exist in Kent, either as new construction, in that period, or as enhancements of earlier structures. During the period of the Revolutionary and Napoleonic Wars with France there was a rapid expansion of fortifications and the introduction of large new defences such as the military canal which was intended to provide a defensive line behind the likely landing beaches and ports. Dover saw a great deal of development of the earlier defences and Kent included the chain of Martello gun towers that was built along the South and East coasts to provide a network of overlapping defensive points capable of hosting a 32 pounder gun. After the defeat of Napoleon, the French threat was considered to continue but at a lower level and the concentration of defensive effort was on port defences. As a result, Kent saw further work at Dover and in the Medway to protect the Channel and the Nore Fleet at Chatham. Between the two World Wars there was relatively little effort expended on maintaining defences until the defence expansion rush from the mid 1930s as politicians slowly began to understand that there was a new and growing threat from Germany. The most noticeable developments were in the construction of bomb resistant underground command and control centres and the erection of the huge Chain Home radar towers, but the author has included the efforts to build acoustic detection systems as a back up against any possible failure of radar. Off-shore, Britain was to build a series of anti-aircraft forts on or near sandbanks. The two types of fort are described and illustrated. One type was built of steel and the design was used and adapted later for shallow offshore gas and oil extraction rigs. The other type was built of concrete, floated out to site and sunk onto the seabed. Many of these installations still survive and several were used as pirate radio stations in the 1960s. One continues in use as a data centre and claims its own sovereignty as a Duchy. The disappointing part of the book is in the Cold War coverage. The text is adequate to the task but has not been supported by photographs that are available and the story is not completed. In fairness to the author, every book is limited in size and illustrations can still be costly, but it is a shame that an excellent book did not finish as well as it might. After WWII, the Cold War presented new challenges and revived old ones. Static fortifications continued to be important and Kent continued to see its defences maintained and updated. Behind the higher ground backing Dover, the Sandwich Levels were to see a modern fortress at RAF Ash. This underground site was a vital command centre for RAF air defences and was last used in military operations during the 90/91 Gulf War when its deep bunker was used to develop some very sensitive computer software. Various air defence facilities were constructed across Kent, some as modern developments of famous WWII fighter stations. Kent also saw the development of a network of underground defences as part of the Royal Observer Corps network that had been largely above ground during WWII. Many small bunkers were built for two-man teams to monitor the spread of radiation plumes following a nuclear strike. These defences were connected back to Group bunkers that were designed to withstand close strikes and enable the personnel to operate sealed off for extended periods as radiation levels reduced and the survivors were expected to recreate a workable society. The story did not end there because several facilities were to become commercial facilities to protect against a new threat. RAF Ash was transformed into a modern data centre to enable clients operating in the City of London and other locations to either move their computer centres to former RAF Ash, or to build mirror sites that could maintain a real-time copy of their data against an attack by terrorists on their City offices or to protect against cyber attack. The Second World War has also suffered an absence of illustration and a scarcity of detail of some of the innovative defensive measures, including the use of armed trains. Again in fairness to the author, illustration can be costly and small pillbox defences lack the impressive image of a medieval fortress, although they collectively formed a major fortress defence, recognizing that in modern armoured warfare and the development of guns and aerial artillery in the form of dive bombers, survivable defences had to be distributed and designed to channel and slow attackers as defenders then concentrated on pockets of invaders. Criticism aside, this is a very interesting book and provides a review of the development of the fortress, viewed through the prism of Kent. The publisher has achieved a low price and this should open the book to a much wider readership, more than compensating for any restrictions in coverage.